Welcome to the Imperial Academy, where children become soldiers! Amongst these children this week is none other than Ezra Bridger, undercover and on a mission to retrieve a tool to reveal the location of a dangerous Imperial cargo shipment. Whilst undercover, his and another recruit's natural aptitude at defeating the challenges placed before the recruits attracts the attention of their teachers who in turn notify those who have an interest in young men and women who appear gifted. Also, our favorite foul mouthed astromech droid gets a temporary paint job. Factoids from the Star Wars trivia page for Breaking Ranks! The titles for the Imperial officers overseeing the recruits, Commandant and Taskmaster, are independent of their actual military rank. Zare Leonis, the recruit who helps Ezra, has his own book coming out entitled, Rebels: Servants of the Empire, in which he investigates the disappearance of his sister. The kyber crystal, which the Imperial cargo vessel is hauling, has the same make up as the crystals used by Jedi for their lightsabers. Thus, they could be used for much larger and devastating lasers...hint hint. This episode featured a new setting for the Imperial blaster rifle, STING. The same type of laser that was used by the remote floating device that Luke attempted to block aboard the Falcon with a lightsaber. The design of the "Well" in this episode for testing cadets was directly inspired by the room used to test clones in the Clone Wars, see episodes, "The Clone Cadets" and "The Box." 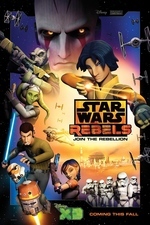 Star Wars Rebels can be seen on WatchDisneyXD.com, the app, WatchDisney, and provider operated OnDemand services. How come, if stormtroopers are trained so thoroughly, they are so terrible. Or was this just a ruse by the inquisitor to seek out force sensitives? The tests did seem to be quite well adapted for force users. Oh, also, I'm sure someone knows, when did the empire switch from clones to recruited troopers? I like the notion that the first death star would have been built far sooner if not for the actions of these Rebels. According to wookiepedia storm troopers started to use recruits about 12 years before the events of Star Wars IV. I found it weird that in training a military personnel, who will have to work in teams, the emphasis was on winning at all cost even if it meant sabotaging your own team mates. I'm no military expert but that might have a negative effect on squad cohesion. >Or was this just a ruse by the inquisitor to seek out force sensitives? I found it weird that in training a military personnel, who will have to work in teams, the emphasis was on winning at all cost even if it meant sabotaging your own team mates. This is pretty fundamental to the design of Star Wars. The point is to show how the Randian dog-eat-dog world of the Empire does indeed allow the most ruthless bastards to claw their way to the top where - according to the Empire - they belong and deserve to be. But in terms of accomplishing larger goals, the Empire is no match for the Republic/rebellion's values of loyalty, trust, and camaraderie. The flaw is that worldview makes the Empire kind of self-obsessed, focused inward on its own artificial political environment rather than the real world. Everyone's goal is to get to the top of the Imperial hierarchy. But overall, the Empire is crap at succeeding in the larger world because its members are more interested in backstabbing each other to win that game than in actually accomplishing the Empire's goals. This is a really consistent theme throughout the Star Wars universe. Beyond that, I can't say this was my favorite episode. Too much packed into too little time - this seems to be an easy trap for this show to fall into as they try to do Star Wars stories in 20 minutes. And I don't think I buy the Inquisitor being involved with a bunch of academy cadets. Sure, there'd be a general order to keep an eye out for cadets that seem like they might be force-sensitive, but are those drill instructor types really qualified to make that call? They'd be registering false positives (and false negatives) all the damn time, and I'm sure there'd be several layers of testing and bureaucracy before they actually get the Inquisitor involved. He's a busy... man? Jason Isaacs does a fantastic job emoting the malice in the words of The Inquisitor when he talks to Zare.